This piece is composed of two electro magnets, a responsive timer relay, power source, and magnetic fluid. Magnetic fluid is put into the center plate, and the two electro magnets are placed above and below it so that the same polar sides are facing each other. The eletro magnets are controlled individually to increase or decrease magnetic strength. 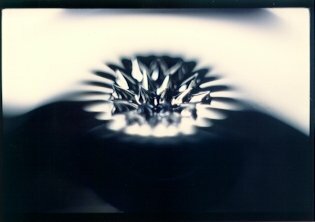 The magnetic fluid can change shape within the magnetic field created by the two electro magnets. 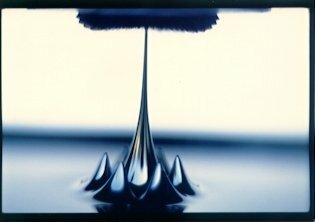 The appearance of the magnetic fluid is a black fluid. It is made by dissolving fero magnetic micro-powder in a solvent such as water or oil, and it remains strongly magnetic even in a fluid condition. Therefore, it is much more fluid than iron sand, enabling it to create more changes and beautiful patterns. The magnetic fluid makes a flat surface on the plate. 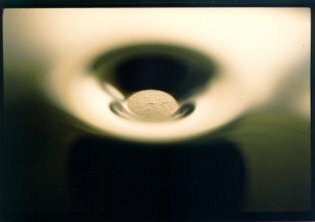 When magnetic power is applied from below, a small protrusion appears on the surface of the fluid (Fig.1). 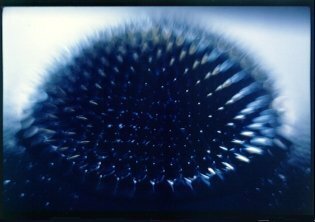 The number of protrusions increase with the increase of magnetic power, and it becomes a half-sphere of spikes. It is like a sea urchin (Fig.2). Then, magnetic power is applied from the electro magnet placed above the magnetic fluid. The same polar sides of the electro magnets placed above and below are facing each other so that the magnetic power works against each other. 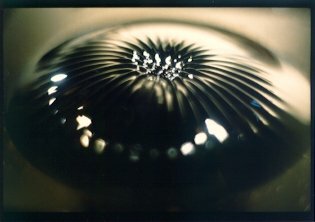 An increase in magnetic power of the upper eletro magnet causes the sphere to be pushed outward, and it changes into lines emitting from the center (Fig.3). Next, the power of the lower electro magnet is weakened. The sharp lines emitting from the center of the (Fig.3) will fade, and it overall will change into a soft donut shape. The surface pull of the fluid will become stronger by the magnetic force, and the shape will become smoother (Fig.4). Next, only the upper electo magnet will be started. Small protrusions on the surface will appear like before, and the number will increase. However, the center protrusion will continue to grow, and the magnetic fluid will start to rise toward the upper electro magnet. The sight of the fluid rising from below is very mysterious. For example, the magnetic strength of the lower electro magnetic is weakened when the magnetic fluid is in a donut shape like before. Then, the power of the upper electro magnet will be stronger, to a rise will start not from the center but from the end (Fig.5). Fig.6 is when the magnetic fluid protrusion is at its largest. 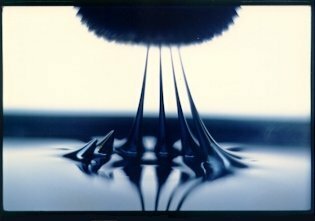 The magnetic fluid will start to flow up if the magnetic strength is increased any more. 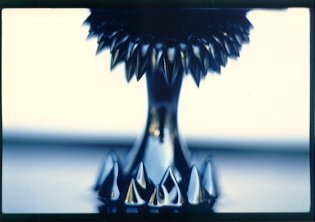 By placing an electro magnet not only below, but also above the magnetic fluid, and by controlling the strength and timing of the magnetic force, it is possible to create various shapes. 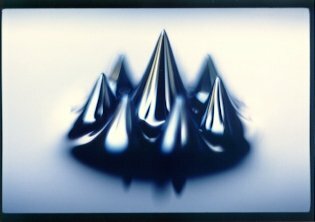 Also, the impression of the shapes will also change depending on the viscosity of the magnetic fluid. Such shapes are created by the balance in the magnetic force, gravity, and the surface pull of the fluid. Until now, I have made productions on themes such as "The unseen force ? 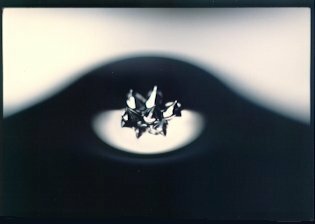 magnetism" or "The unseen force ? gravity". I hope that this piece will be a good chance for people to feel the presence of an unseen, but existing force. 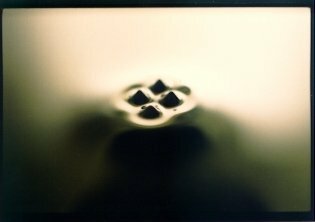 This work has the award as the Best Artwork of "Katachi U Symmetry" Conference (Tsukuba, Japan, 1999).